Contains a number of omega-3 fatty acids. Reduces certain risk factors for cardiovascular disease and lowers the risk of recurrent heart attacks. Beneficial for the prevention of coronary disease and the treatment of depression. 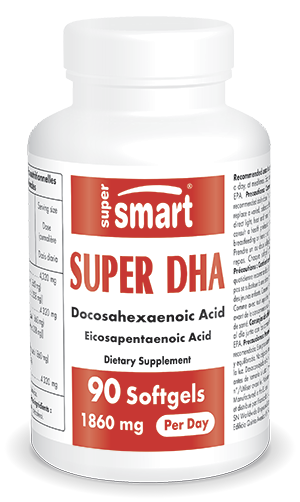 Our dietary supplement Super DHA has been specifically formulated to provide docosahexaenoic acid, commonly known as DHA. Numerous scientific studies have been published on this substance – indeed, DHA is one of the most established of the omega-3 fatty acids. The body needs omega-3 fatty acids, often referred to as ‘good fats’, in order to function properly. They are also considered essential – in other words, they must be ingested from the diet as the body is unable to produce them. In the case of DHA, this means eating foods rich in omega-3s such as oily fish. However, dietary sources may not provide sufficient levels, hence the development of a number of omega-3-rich supplements. In order to offer the best possible omega-3 supplement, our teams have been working to develop an innovative formulation that combines DHA with another form of omega-3: eicosapentaenoic acid or EPA. Following extensive testing, the result is this new Super DHA supplement, offering a complete omega-3 solution. lipid functions, by improving the lipid profile. maintaining normal cholesterol levels, so preventing a rise in the ‘bad’ cholesterol responsible for cardiovascular problems. As a result of these effects, it seems omega-3 is particularly important for preventing certain forms of cardiovascular disease, including coronary diseases. Other studies have shown that omega-3 supplementation may offer benefits in lowering the risk of recurrent heart attacks, improving depression and reducing symptoms associated with the menopause and psoriasis. In order to offer the best possible omega-3 product, our Super DHA supplement is produced from a high quality fish oil obtained from several different fish species (sardines, mackerel and anchovies) selected for their naturally high content in omega-3 fatty acids. These premium fish also have Friend of the Sea® certification, meaning they come from sustainable fisheries that conform to strict criteria with guaranteed management of fishing quotas. Located along the coasts of Peru and Chile, these clean fishing zones are free from industrial contamination. A molecular distillation process further enhances the quality of our omega-3 supplement. This innovative technique not only removes all traces of contaminants (mercury, lead, arsenic) but also provides an optimal DHA concentration. This produces a fish oil standardised to 50% DHA and 10% EPA. To ensure maximum benefit from these omega-3s, the DHA and EPA are delivered in softgels, with a recommended dose of one to two capsules per meal. This dose can be adapted according to your needs and the advice of your therapist. You can buy this complete DHA formulation today, with our easy, on-line ordering system and extensive worldwide delivery options. Warning: Product derived from fish. Contains traces of soya.